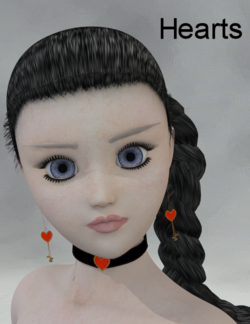 Hearts Jewelry for V4/V3/A3/Alexa2 is a jewelry set for Alexa 2, Aiko 3, Victoria 3, and Victoria 4. It includes earrings, a choker, bracelets, and a belly gem for each figure. This page was last edited on 12 June 2018, at 22:52.